↑ "Planning Iceberg, Chp 2 of Okinawa: Victory in the Pacific by Major Chas. S. Nichols, Jr., USMC and Henry I. Shaw, Jr". Historical Section, Division of Public Information, U.S. Marine Corps. สืบค้นเมื่อ 2010-05-07. Hastings, Max (2007). Retribution - The Battle for Japan, 1944-45. New York: Alfred A. Knopf. ISBN 978-030726-351-3. Sloan, Bill (2007). The Ultimate Battle: Okinawa 1945--The Last Epic Struggle of World War II. Simon & Schuster. ISBN 0743292464. Yahara, Hiromichi (2001). 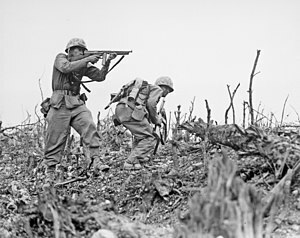 The Battle for Okinawa. John Wiley & Sons. ISBN 0-471-18080-7. -Firsthand account of the battle by a surviving Japanese officer. Zaloga, Steven J. Japanese Tanks 1939-45. Osprey, 2007. ISBN 978-1-84603-091-8. หน้านี้แก้ไขล่าสุดเมื่อวันที่ 25 เมษายน 2562 เวลา 20:54 น.